Gaps In Folded Arms = Creatures Falling Through the Gaps Of Folded Arms ! Creatures Can't Hang On, They Are Shown As Dropping! There seems to be a type of road the creatures are trying to hang on to, unless it is figuratively speaking! A type of sculpture analogy etc. After seeing so many sculptures, there certainly has to be thousands if not millions of these highly detailed floor memorial related sculptures ! They seem to have a sculptured language the likes of which we earthlings have never seen. all what the photo seems to bring out ! loosing their beloved creatures when the martian surface was destroyed in extreme antiquity! And the atmosphere as well, forcing the Martian civilization to go underground! in their underground cities! Ernest Norman's book tells of this! He was telepathic and communicated with a Martian called "Nur-El" . ​ Martians new about 200 years in advance that a terrible planet ending solar flare from a super nova would hit their planet. Through their very advanced technology ! So you can only guess how advanced their underground civilization must be now ! It is no wonder that Gary Wilcox when visited by 2 Martians at about 10:30 am on April 24th, 1964, that the two Martians that got out of their oval space craft on his 300 acre farm, they ask Gary how he could see them because they could cloak their craft ! Added information that I think I've gleaned from this small Curiosity photo! unless it was before the actual cataclysmic event in extreme antiquity ! creatures into containers because they would just let the dead decay and rot. Also you wouldn't see a creature hiding from the extreme heat if it were dead. new that the outcome of mass death would be inevitable ! "Odd Hand & Arm Gestures" Show That Martians Couldn't Handle The Devastation". Killing off almost all the creatures that lived above the surface of the planet. And creatures are trying to stay away from it! like a big-foot. I have seen in another Mars-Curiosity photo a being that looks like that as well! GREEN is NOT ancient ! Props such as feet, shoes seem to be used as analogies ! Very important key to notice to establish this as truth that these "outside floor memorial story sculptures" are intact telling about "creatures flowing downhill". Notice how the flow going downhill matches to the sections on the first level (right above the flowing downhill) of objects hitting or laying in pieces. Pay attention to the "yellow outline" and how that matches the "flowing" ! Follow the "light bulbs" going down hill ! ​Creatures Falling And Martians Can't Seem To Feed Them ! bins for their final resting place! Creatures Fall Like Avalanches And Martians Try To Turn Back Flood Of The Dead And Sick! Needing to Pile Them in A Final Resting Place! 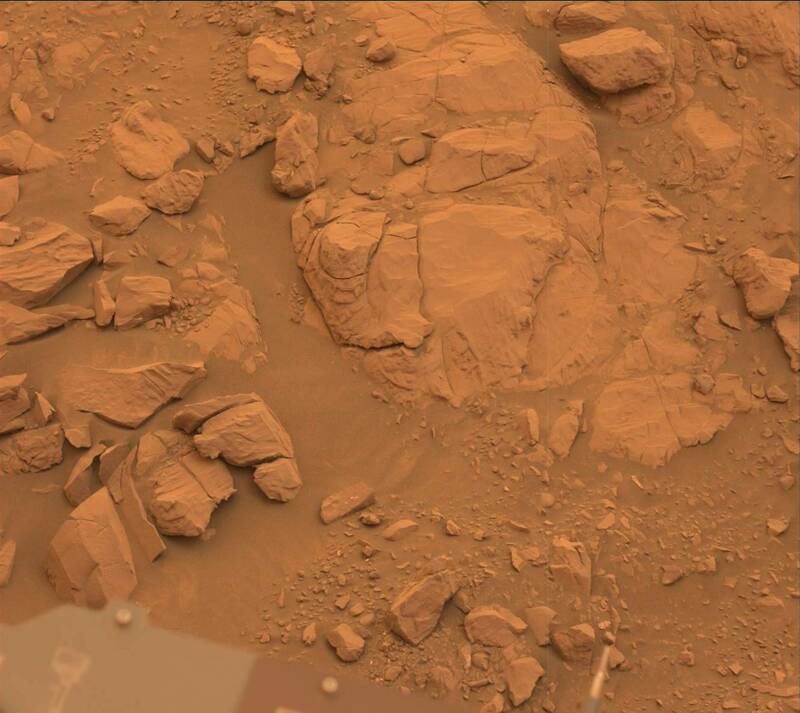 An Important Section Of Mars Falls Apart ! Seems to be mechanical in special areas! This Sculptured Scene Look Like Something Is Falling And a Crocodile Looking Creature Is Involved. being hit by a great catastrophe ! And it seems to ALWAYS add up with the loss of the martian atmosphere and their planet's surface destroyed in extreme antiquity. Of corse reptiles could be living even today on mars and where able to survive the terrible catastrophe that ended the planet's surface forcing civilization to go underground the martians still have to deal with reptiles leaking into their cities underneath the surface of the planet ! Containers Can't Contain The Dead Creatures and Vessels For Transporting Can't Contain Them Either! Please ZOOM in for more clarification ! Land Tilted - Creatures Being Forced Downwards ! Notice how "white" plays an important part in martian story-like sculptures! when mars lost it's atmosphere and the martian planet's surface destroyed in extreme antiquity ! they seem to be related to "falling" and what greater "falling" is there if it wasn't objects falling upon them in extreme antiquity, when they lost their atmosphere. martian memorials with stories of their destruction and passed down from generation to generation! But something else. Don't you think like in the case of Gary Wilcox how said he talked with two martians, they wore space suites from head to toe! Even Lonnie Zamora said the same martians, when they both (in my opinion" saw martians on April 24th, 1964. Around 10 am in NY and 5:45 pm in New Mexico. Land and Creatures Falling From Catastrophe That Ended Mars Surface? Shirt Vacant, Then Seemingly In The Process Of Being Restored With A Being ! Notice in the cyan colored circle, the act of restoration !